The relentless struggle of those who fought against the oppressive apartheid regime in South Africa has produced many heroes. Amongst this list of honourable icons is Chief Albert Luthuli, who was awarded the 1960 Nobel Peace Prize for his role as the leader of ten million Africans in the non-violent struggle against apartheid. He was the first African and individual outside of Europe and the Americas to been awarded this prestigious accolade in Oslo, Norway, formally on 10 December 1961. His famous statement “the road to freedom is via the cross” clearly depicts his dedication to freedom and his aversion to violence. Foundational to this once in a life-time recognition at the Nobel Institute, it is imperative to understand the ‘story’, so to say, behind the glory. Let us consider the background and experiences of this African humanitarian. Chief Albert Luthuli was born in Bulawayo, Rhodesia in 1898. Ten years later, his father passed away and he together with his mother returned to their family home in Groutville, Natal, South Africa. As a bright and religious young man, Luthuli was passionate about education having being trained as a teacher in the former years. As a professional educator for the following fifteen years, he strongly advocated that education should be equal and available to all Africans, as well as liberal and not merely vocational in nature. In 1928, he was appointed secretary of the African Teacher’s Association and in 1933 became its president. 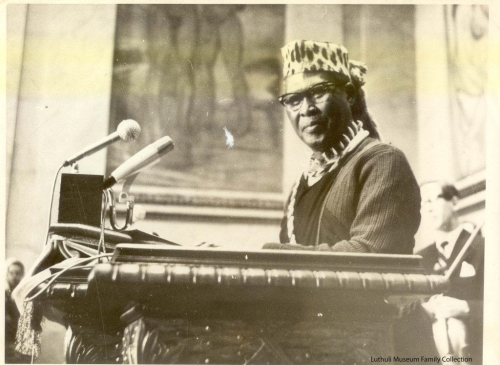 In 1935 Chief Albert Luthuli was democratically elected Chief of the Umvoti Mission Reserve and on January 4, 1936 he was inaugurated to the position. His decision to leave teaching was a huge sacrifice because the salary that he would now receive, as Chief, was significantly lower than what he had earned as a teacher. This position as chief exposed him to the socio-economic and political issues directly affecting the people of Groutville and he soon realised that these issues were not confined to the geographical location but were experienced by Africans in South Africa. As Chief he remained steadfast in enhancing the lives of his people. It is also important to highlight that he was a Christian of deep conviction and contributed largely and meaningfully to the life and dynamics of the Groutville Church and became a chief Deacon. His sermons were loved by all including the youth. As chief of AbaseMakholweni Luthuli also played a leading role in the formation of Natal and Zululand African Sugarcane Association and provided the much needed ‘leadership’ at this level too. He was always in search of what he could do to advance the economic conditions of the community that he led. There is no doubt that the 21st century requires leaders such as Chief Luthuli who would have a vision and developed constructive mechanisms to attain such vision for their people. Later, he was elected the Chairperson of the Natal and Zululand Sugarcane Growers’ Association. In 1945, Chief Albert Luthuli joined the ANC (African National Congress). His great leadership acumen led to his election as the leader of the ANC in Natal and ultimately the President-General of the ANC nationally in 1951 and 1952 respectively. As the President-General of the ANC he displayed great and excellent leadership during the times when the apartheid government was vigorously entrenching its racist laws in South Africa. He was very sure and firm about the vision of the ANC and very principled in the great fight against the oppressive regime. He was indeed a great visionary. As a leader he was exemplary to his people and he showed this by burning his own pass after the Sharpeville massacre of March 21, 1960. In leading his people he was always democratic and consulted his people before any decision could be taken. He was honest, transparent and accountable to his people. These are values which the Centre for Responsible Leadership should inculcate to the younger generation. Albert Luthuli called democracy a “fine thing” that is at the apex of human achievement and which could not be successfully kept from other people. Albert Luthuli understood that the task of building a humane society was to be a process, not an event, and that a leader leads by example. In 1955 and again in 1958, Luthuli was re-elected as president of the ANC attesting to his solid leadership and passion for freedom. Luthuli played a pivotal part in implementing the Defiance Campaign, the name given to non-violent protest against apartheid. During the notorious Sharpeville Massacre in 1960, he led a peaceful protest, which unexpectedly became violent, resulting in 72 demonstrators being shot and killed. Luthuli responded to this atrocity by openly admonishing the police violence, and publically burning his passbook. The government sought to minimise his effectiveness as a leader by implementing banning orders on him and arresting him for high treason in 1956. This was one of several attempts to weaken his leadership. On 21 July 1967 Luthuli was killed, reportedly when he was struck by a train close to his Natal Home. The Luthuli house, where Luthuli was also confined to for several years whilst under ban and was also visited by US Senator Robert F Kennedy, in 1966 is now the Chief Albert Luthuli Museum. This short synopsis and background about Africa’s first Nobel Laureate, freedom fighter and humanitarian bears testimony to his indelible and praiseworthy contribution to freedom – the impact of which will resonate for generations!